Autograph size & location may vary. 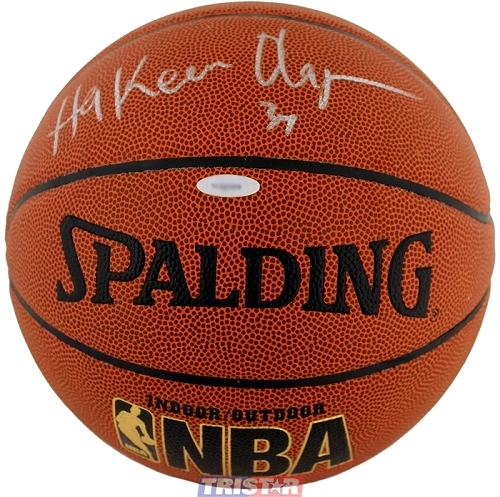 Hakeem Olajuwon personally hand signed these Spalding Indoor/Outdoor NBA basketballs. Each autographed basketball includes an individually numbered, tamper-evident TRISTAR Authentic hologram. Hakeem Olajuwon is considered to be one of the greatest basketball players to ever play the game. Olajuwon ended his career in the top ten all-time in scoring, rebounding, blocked shots and steals. He is the only player in NBA history to retire in the top ten in all four categories. Among his many career achievements, Olajuwon was a 12-time All-Star, led the Houston Rockets to back-to-back world championships in 1994 and 1995, and was a two-time NBA Finals MVP. Hakeem Olajuwon was inducted into the Basketball Hall of Fame in 2008.